Del Mastro-Chruma, a Catholic, told Currents News that she had been friends with Marc’s wife, Lisa, for decades. So when Marc was about to be eligible for a kidney transplant, Del Mastro-Chruma thought about how she could help. Being the president of a billboard company that advertises in Times Square allowed her to put out a call for help to the world. Normally the spot, which runs twice every 15 minutes, would cost $30,000 for two weeks, but she doesn’t let the Weiners worry about that. She just hopes a match is made. She decided to take the idea and blow it up the size of a Times Square billboard. 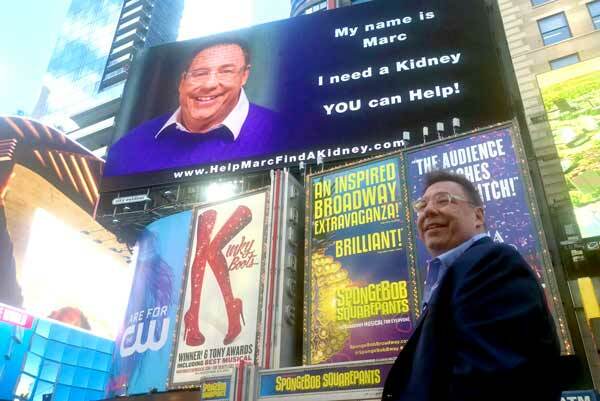 The Marc Weiner billboard not only reaches people physically in Times Square, but everyone who notices and puts it on social media. Even mainstream news wanted in. Marc Weiner was diagnosed with a serious form of bladder cancer in 2015. The doctors at Mount Sinai Hospital came to the conclusion that he would have to have his bladder, prostrate and both kidneys removed. But the doctors assured him he could still be active, eat and exercise. “It was truly amazing that five days after losing four organs, he literally walked out of the hospital,” recalled Lisa. She said that through all the therapies, even chemo, he still looked like a healthy guy. It is, of course, still difficult. It means doing dialysis three times a week to keep up with the work a bladder does naturally. But there is good news for the couple, and their 12-year-old daughter: Marc is cancer free for almost two years and is about to be eligible for a kidney transplant. That transplant can come from two sources. One is from the waiting list, which has a five-year wait time. The other option is to find a donor directly. That’s where the billboard comes in. It directs people to www.helpmarcfindakidney.com.